In the case of this website, a conversion happens when a user to sign up and make an account. The focus of the website is a free event planning service, that was started about 2 months prior. The bounce rate was 52%. There are different things that can cause a bounce. Sometimes the user is not happy with first impressions or was expecting something different when they arrived. It can also happen when a site does not seem trust worthy. You always want to keep your bounce rate below 50%. The bounce rate is also important to search engines. When search engines see that your site gets a high rate of bounces it will assume that your site is not relevant to users, therefore lowers its ranking in results. The user sign up rate was 1%. So out of all the visitors 1% was signing up. The site was getting about 30 visitors per day, and out of every 100 visitors, 1 would sign up. While this is not a terrible conversion rate especially for a new website, we wanted to see how we could improve it. We had the simple idea of increasing the font size all across the site. The font size looked somewhat small and we thought it might affect users but we weren’t sure. We tried this simple change and ran A/B (split) tests to see the impact. Split testing is when we run two versions of the same website at the same time while varying only one item. The item we varied was the font-size. We used 14px and 16px to see which users preferred. The results were clear. Visitors preferred 16px font. You can see it from this comparison graph. This change alone increased conversions from 1.08% to 3.33% percent. Increasing the font is not a silver bullet that fixes every site, but it worked well for this site based on its composition. We also changed the appearance of links; they previously did not stand out enough from the body text. Links should catch the eye of your readers while not being overly distracting. The site links originally did not stand out enough and users were not clicking on them to continue their interactions with the site. Next we examined the paths to sign up or get a conversion, also known as our conversion funnels. There were presently three ways to sign up. A link from homepage, a link from the about page, and a link from the join page. Based on user flow, we wanted to see if there was another place to put a sign up link that would seem natural for the users. After searching we noticed there was a demo page that show cased the features of the site. Having a demo page was perfect for this type of invitation website because users can see exactly what it can do before signing up. We noticed that the demo page simply sent the users back to the homepage and gave them no opportunity to sign up. The demo page previously had a 50% drop off rate. Which means 50% of the people would leave the site after seeing the demo page. We improved our sign up funnels by improving the demos to better highlight the features of the site, and show how it would be used by customers. We also added 2 more demos, and the 3rd one sends the user to the sign up page. The drop off rate of the demo page decreased to 20% and users kept interacting. 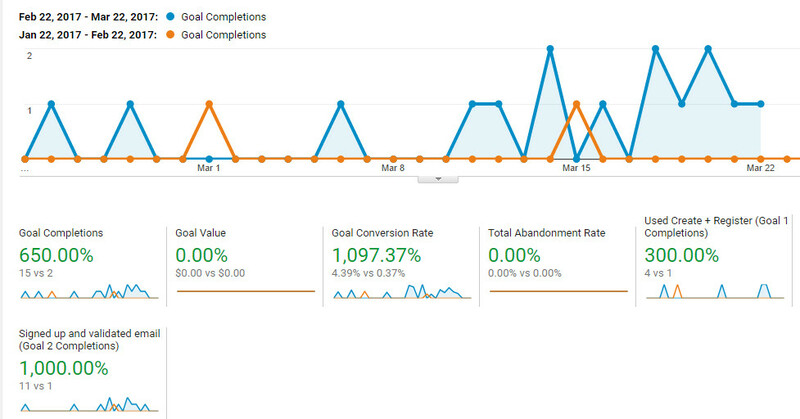 The next two chart shows the changes in site metrics after completing the changes mentioned here. These enhancements are just the beginning of changes that can be done to improve conversions. There are many other factors such as user’s trust, color scheme, placement of call to action, page speed, and even target audience that can come together to optimize conversions rate. Neglecting to optimize a site for conversion is like having a leaky bucket, no matter how much water you put in, you’ll keep losing some. Each site is different, and we take an analytic approach to improving websites and we use our numbers and metrics to see what works and what does not work. The overall goal is to give customers the website experience that they want, which will then translate into more sales and conversions.